On Sunday, three Israeli soldiers were wounded when a Palestinian man opened fire at an IDF checkpoint near the West Bank settlement of Beit El. The Palestinian terrorist (a member of the PA’s security forces) was killed by Israeli security forces at the scene. Here’s the headline accompanying a Times of London print edition story on the incident. This perverse editorial decision represents one example within a larger pattern – at both British and American media outlets – of prioritizing the fate of the perpetrators over that of their victims when reporting terror attack in Israel. See CAMERA’s continually updated post (Wave of Palestinian Violence Accompanied by Spate of Bad Writing) for more examples of such egregiously biased headlines. The Sunday Times, the Holocaust and Israel: Have the persecuted become the persecutors? I would like to see The Times of London’s explanation of how Palestinians “despaired” before 1967 and still tried to murder Jews on a wholesale level. “palestinian” despair is the same despair of nazis who surrendered, unconditionally to the US, UK and SU in May 1945. Evil will always lose, unconditionally..
Because the Times has Jewish staffers who don’t know their history of the Holy Land, otherwise they would NOT publish this drivel this way. “Daniel Finkelstein is a weekly columnist, leader writer and Associate Editor of The Times. Before joining the paper in 2001, he was adviser to both Prime Minister John Major and Conservative leader William Hague. Daniel was named Political Commentator of the Year at the Editorial Intelligence Comment Awards 2011 and 2012.”. Are awards more important than the truth?? Court Jews prefer awards – unaware how the people they crave a pat on the head from, laugh at them behind closed doors. I was stunned, disbelieving and disappointed when I first read this. Not just the headline, but that such a news in brief type report still had to tack on the despair narrative. But this appears to be an AP report lazily picked up rather than their own reporter. Bad editorial choice: laziness or malice? Unfortunately both. Take a look at both AP and Reuters reports on Israel – they are all tarred with the same brush and Netanyahu is afraid to deal with the problem and kick these liers out! Just to be sure, the Western Media still doesn’t buy into the notion that Hamas and the PA utilize social media to encourage their youth to sacrifice themselves in terror attacks waged against mostly unarmed civilians. Phew….. I would sure hate for THAT to happen. 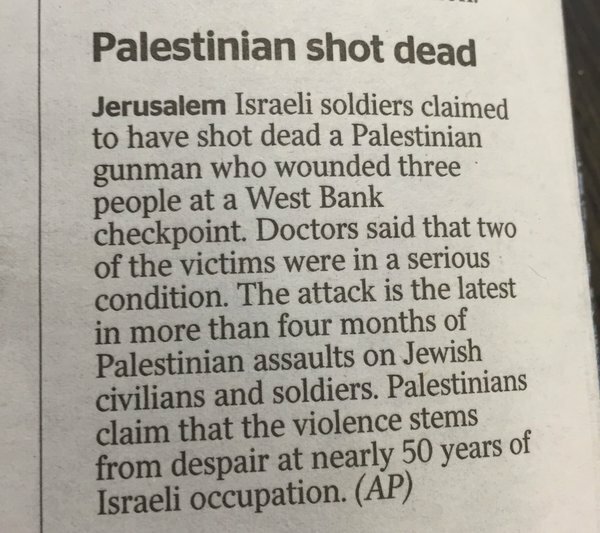 “Israeli soldiers claim to have shot dead a Palestinian gunman…” hilarious. Is he really alive or was it the fall rather than the bullets that killed him? Is anyone sure of anything anymore? If so, is there anyone qualified to write about it? The MSM’s Israel coverage contributes to global warming.